The ‘356 patent describes a hand-held baseball game with interactive fielding and throwing options. In past baseball games, whenever a fielder caught the ball, the player had to press a button corresponding to the base he wished to throw the ball. Users were apt to make errors and press the wrong button in their haste. The ‘356 patent aims to reduce this error by allowing a player to press a button which corresponds to a relay player. 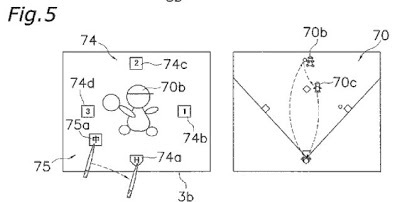 This character will catch the ball after it is released incorrectly. Once the relay character has the ball, the user can choose the correct base to throw the ball. With a game implemented by the present game program, ball dispatch origin characters will be displayed on a monitor. In addition, characters corresponding to ball dispatch destinations will be displayed on the monitor. A ball dispatch destination character will be identified when the command means is placed into contact with one of the characters corresponding to the dispatch destinations. If this occurs, a ball character will be dispatched from one of the ball dispatch origin characters to one of the ball dispatch destination characters. 1. A computer readable medium storing a game program for causing a computer to implement a game in which a moving object is dispatched from a character displayed on a touch panel type of monitor, the game program comprising: code for displaying a dispatch origin character which is a dispatch origin of the moving object; code for displaying at least one mark corresponding to a dispatch destination of the moving object on the monitor; code for identifying a dispatch destination character of the dispatch destination corresponding to the mark by allowing a control unit to recognize a coordinate of the dispatch destination character when input means is placed into contact on the monitor with the mark, and allowing the control unit to recognize the dispatch destination character on the basis of the coordinate, the dispatch destination character being set on a position which is different from the position of the mark; and code for displaying the moving object which moves from the dispatch origin character to the dispatch destination character identified, by allowing the control unit to issue signal to dispatch the moving object.